This is a sponsored post. I was fortunate enough to receive monetary compensation and/or products from Canadian Turkey. Though compensation was received, all opinions are my own and I would not recommend a product that I did not enjoy. I spoke briefly about my overall theme in the last post: Cooking Around the World with Canadian Turkey. We began with an appetizer recipe that has Asian-influence. 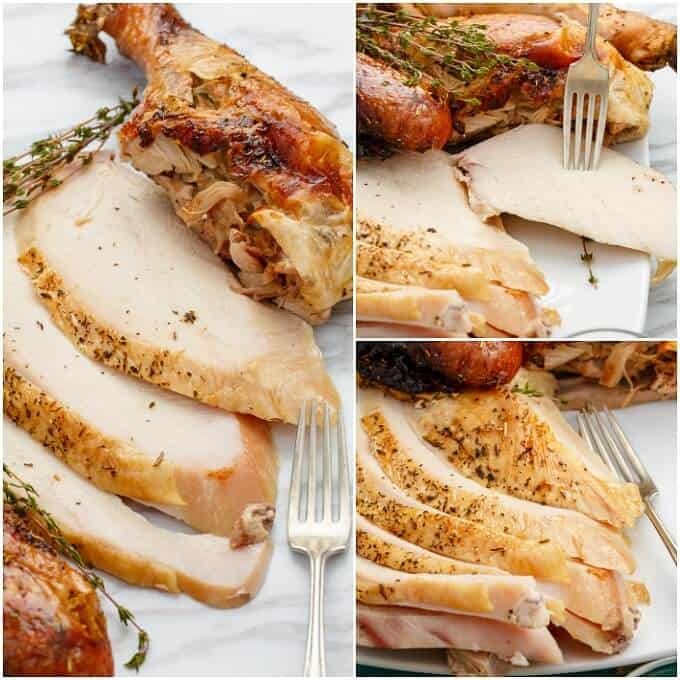 Today’s herbes de Provence turkey is all bout French cuisine and utilizes the whole bird, showing you that even though there are no holidays around, whole turkey makes the ideal summer party food! French cooking is big here in Canada and what better way to showcase the cuisine than combining it with a healthy, lean cut of protein! My herbes de Provence actually come all the way from France (a friend gave me some from her sister-in-law’s recent trip) but there are so many store-made versions you can find. Better yet, you can even make your own! Such a simple mixture that yields great flavours! Now that we are outside more than ever during these hot months, we are often scrambling for dinner ideas! I for one cannot wait for a pool where I can just spend all day outside and then not have to worry about heating my house in the end. 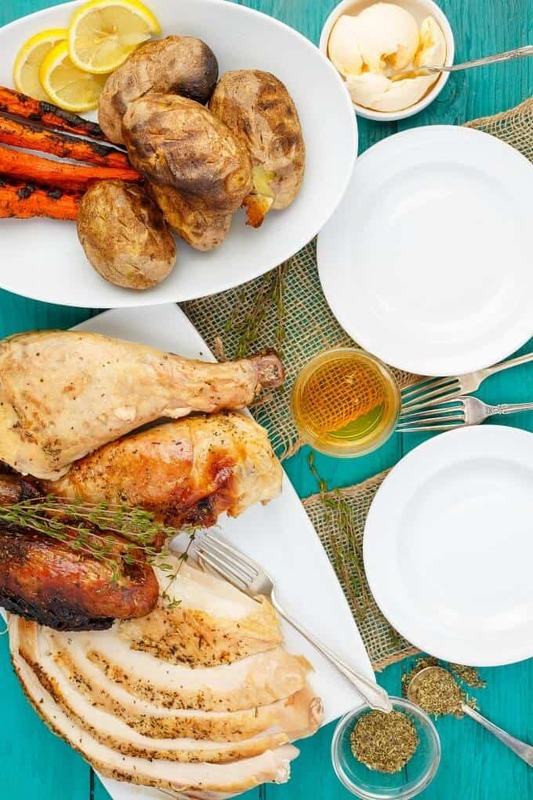 Break out the BBQ because this grilled herbes de Provence turkey is a life-changer! 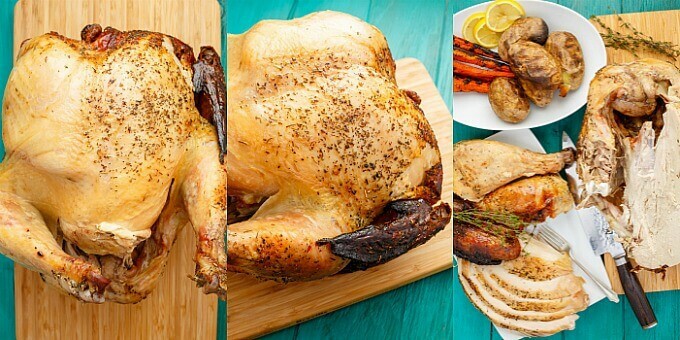 With this grilled herbes de Provence turkey I wanted to showcase a new grilling method. We did go with indirect heat again, which was discussed in the previous post, but this time we went with the beer can turkey method. You fit a whole turkey onto a beer can?! Yes I did, haha. If you happen to follow me on Instagram you would have seen how I managed this! Thankfully my husband had a tall can kicking around 😉 Now I know there is controversy to whether this method is appropriate or not for meat, but I want to state that I went with this method because I wanted a nice, crispy skin, all the while yielding tender meat. When the turkey is upright, all the fat drips into the pan below. 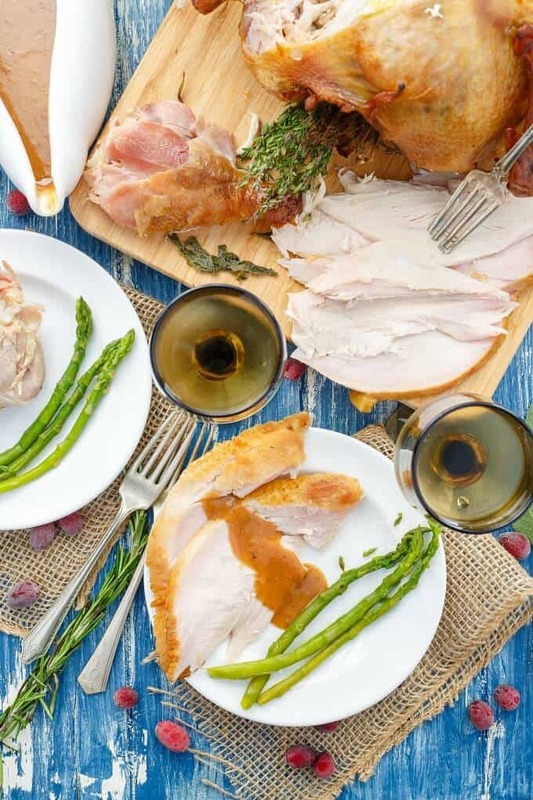 This means no gooey turkey skin from sitting in excess liquid… You know exactly what I mean! 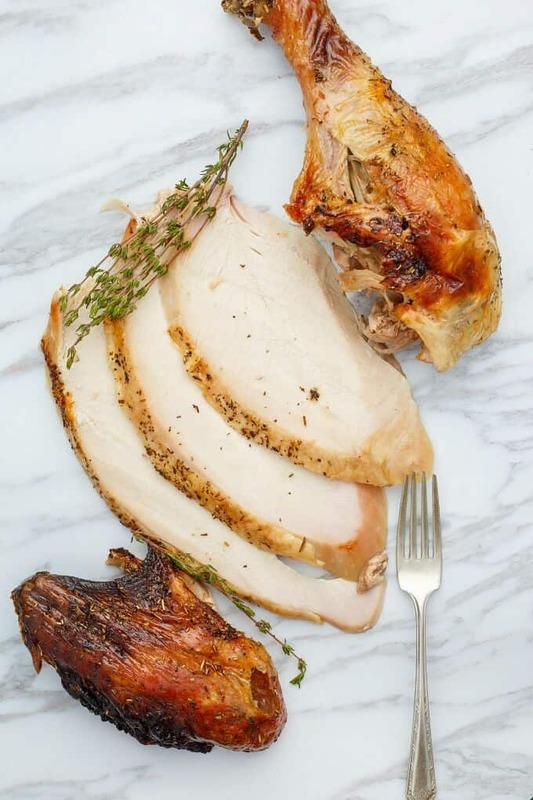 With all the fat dripping from the herbes de Provence turkey, you are gently coating the skin, allowing for crispiness, but locked in moisture under the skin! When you grill your food, you are rewarded with moist meat, locked in flavours, and a natural smoky flavour! 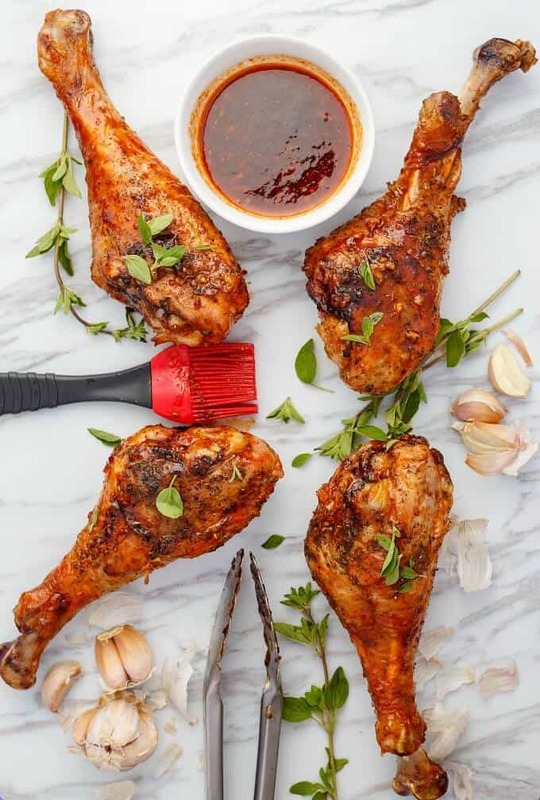 And with simple rubs and marinades, you don’t need to douse everything in sugary or salty sauces. Much like the previous recipe, you are cooking your turkey over a burner that is not on, leaving the other burners on to create a warm oven. Resist opening the lid of the BBQ constantly as you will only slowdown cook time! The only thing I would do differently is rotate the turkey halfway through as I found my turkey was on a slight angle (meaning less even cooking colour!) Otherwise, I cannot get over how easy this beer can turkey is! 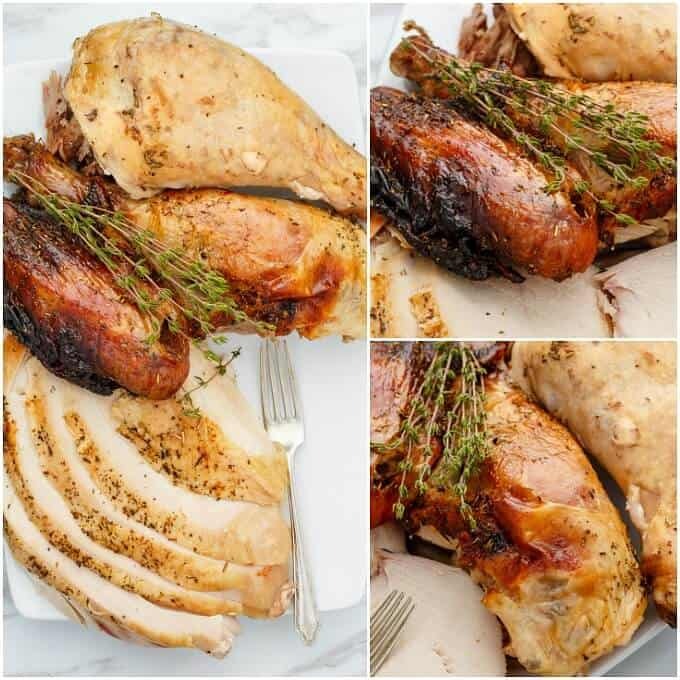 I feel I will be outside on the grill during the colder months for Thanksgiving as this was one of my husband’s favourite turkey recipes to date! 1 (7.5 kg/16 1/2 lb) whole turkey, giblets and neck removed. Combine 6 cups cold water with sugar and salt in a large saucepan over medium heat. Stir occasionally until salt and sugar have dissolved (no need to boil!) Remove from heat and cool to room temperature. Crack open tall can of beer and pour a couple of tablespoons into a glass (don't throw it out! Drink it!) Place can into a grill-safe dish or aluminum pan. Carefully place the turkey on top of the can. Rub entirely with Herbes de Provence. Remove from pan, discard beer, cover with aluminum foil. Allow to rest for 20 minutes before serving! For more safe handling guides and how-to’s when dealing with a whole turkey, please visit Canadian Turkey. Be sure to come back in a couple of weeks to see what part three of my series will be! Hint hint, it is salad time! What a great idea! I have never considered making a beer can turkey, but now I MUST try it! Looks so delicious!